Since its early start, the FREEWAT project has established close collaboration with some key related initiatives and H2020 sister projects. Its worth mentioning the synergy with the ICT4Water Cluster, as throught its newsletter further dissemination is persued for the FREEWAT results and achievements. Below, a short description of these projects and the Cluster and the relative links to the websites. BlueSCities aims to develop the methodology for a coordinated approach to the integration of the water and waste sectors within the 'Smart Cities and Communities' EIP. It identifies synergies in accordance with the Smart City context and complements other priority areas such as energy, transport and ICT. The project seeks to contribute to the achievements of the 20-20-20 objectives. Placing emphasis on local solutions for global issues, the proposal looks to improved public engagement and enhanced decision-making processes at all political levels based on scientific knowledge and adequate social and economic awareness. Practical and scientific knowledge related to groundwater research and innovation is scattered amongst various actors throughout Europe. KINDRA will develop an inventory of this groundwater knowledge-base, creating a new uniform EU-harmonised categorisation approach/terminology for reporting groundwater research. This requires an effective assessment of the state-of-the-art of hydrogeology research across different geographical and geo-environmental settings, allowing for direct comparison and identifying synergies . The final objective is to improve management and policy development for groundwater resources on a EU level coherently with the Water Framework Directive (WFD) and the Groundwater Directive (GWD). WaterInnEU’s vision is to enhance the exploitation of EU funded ICT models, tools, protocols and policy briefs related to the water sector and to establish suitable conditions for new market opportunities based on these offerings. One of the pillars of WaterInnEU is to stimulate and prioritize the application of international standards into ICT tools and policy briefs. The standardization of formats, services and processes will allow for a harmonized water management between different sectors, fragmented areas and scales (local, regional or international) approaches. 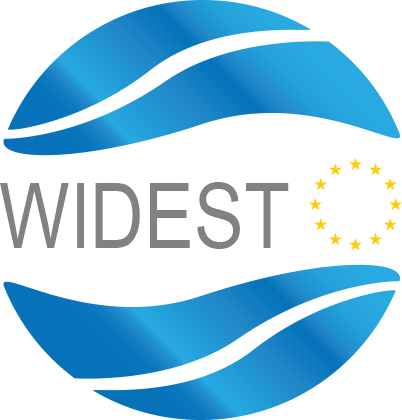 WIDEST is a European Commission (H2020 Coordination and Support Action) project. The vision of WIDEST is to establish and support a thriving and interconnected Information and Communication Technology (ICT) for the Water Community with the main objective of promoting the dissemination and exploitation of the results of European Union (EU) funded activities in this area. Once the project ends, the vision is twofold: in one hand, contribute to advance the consolidation of ICT for the Water Community that will be better informed, defined and integrated than today; on the other hand, WIDEST will help the results and outcomes from current research projects improving their exploitation plans and increasing their dissemination potential by delivering co-produced knowledge to a wide range of stakeholders and actors within the water community.